When it comes to our bodies, there are many seemingly unrelated things that can actually affect our mental health and our general feeling of well being. From the foods we put into our body to the amount of exercise we get each day, there is a clear link between our physical health and our mental well being. In this episode, Trevor discusses how depression can sneak up on us at any time and the false sense of security that we create in our minds when we've had a series of consecutive ... See More 'good days'. Then we talk to Christopher M. Palmer, MD (5:40) and director of the Department of Postgraduate and Continuing Education at McLean, who has spent the last 20 years working on treatment resistant cases of mental illness and the idea that diet can put psychiatric conditions into remission. Dr. Palmer goes pretty deep and shares lots of interesting information in this one, so check it out! 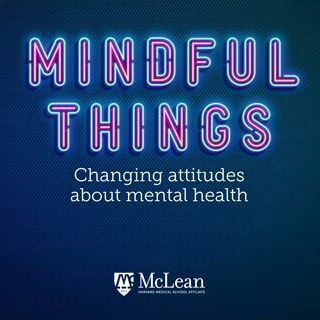 The McLean Hospital podcast Mindful Things is intended to provide general information and to help listeners learn about mental health, educational opportunities and research initiatives. This podcast is not an attempt to practice medicine or to provide specific medical advice.